DENTON-- Fashion is one of the upward trending topics among young adults from around the world. Models and creatives emphasize that style is an important way to express yourself, and UNT freshman, Michael Sheppard, is doing just that. Sheppard, 19, is a biology major at the University of North Texas but his mind isn’t totally focused on biology, he began modeling as a sophomore in high school and it opened another alley of opportunity when he arrived at UNT. He is getting ready to launch a fashion line named Grove Street in the upcoming weeks. 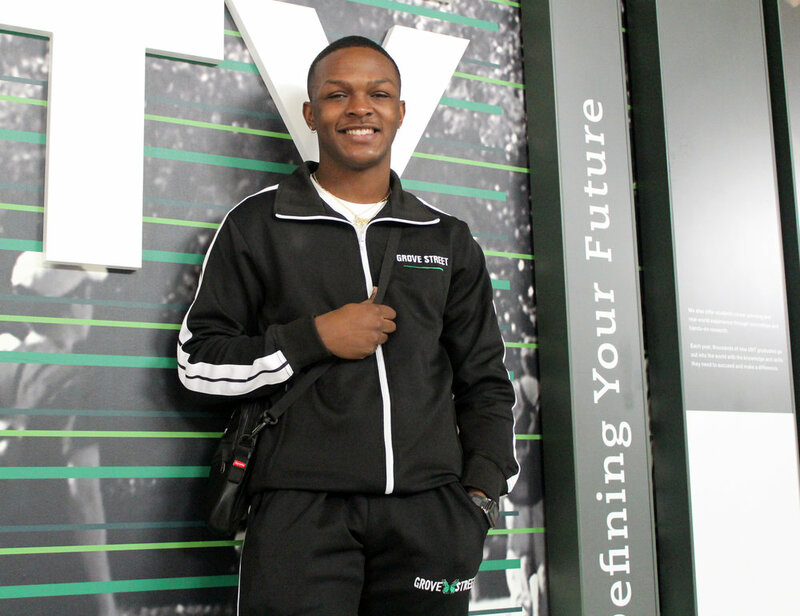 Michael Sheppard, 19, wearing the first Grove Street tracksuit at the University of North Texas, Denton campus. Sheppard collaborated with two of his friends, Amari Hayes and Jordan Atkins, to develop the line of clothing but wanted to make sure it wasn’t an ordinary clothing line made by college students. The Grove Street clothing designers incorporated the motto into the butterfly logo to show how a butterfly is at its full potential in life and displays the growth of life. The pop culture driven streetwear brand is focused on reaching many young adults before expanding to an older demographic. Sheppard was inspired by many other clothing lines to bring his to life including Palm Angels and Needles. Grove Street is following suit of these brands by releasing a variety of tracksuits which Sheppard hopes to be their signature look. “We want that [tracksuits] to be the basis of our brand but we are looking to expand to every genre, t-shirts, hoodies, sweatshirts, everything.” Sheppard said. The merchandise will be available in two weeks on Instagram @grovestreet.apparel.